One whose diet includes fish but no other meat. Since moving to Utah five years ago, Bret Lucas has worked as a personal trainer at Age Performance, a gym that focuses on fitness concepts for older adults. A Chicago native and avid competitor, Lucas moved west to experience the mountains and challenge himself with diverse outdoor activities such as running, hiking, mountain biking and snowshoeing. To date, Lucas has competed in 40 triathlons and more than 30 marathons, and he’s currently training for his seventh Ironman—a long-distance triathlon that includes a 2.4-mile swim, followed by a 112-mile bike ride and finishing with a grueling 26.2-mile run. With such an active lifestyle, it was remarkable to learn Lucas is a strict pescatarian. The term was coined in the early 1990s and refers to a vegetarian who adds fish and seafood to his or her diet. A visit to a cardiologist confirmed he was in great shape and had nothing to worry about. But Lucas took it upon himself to do some research of his own and began to consider that meat-eating was contributing to his heart-rate problems. He stopped eating meat—cold turkey. He even became vegan for a short period but now eats fish twice a week. 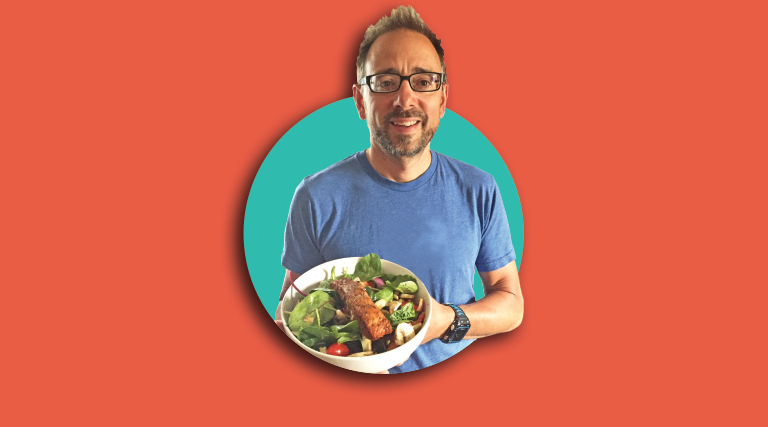 Through his research, Lucas learned of the many health benefits of a pescatarian diet, including a lower risk of obesity and chronic diseases like heart disease and diabetes. Seafood is an excellent source of omega-3 fatty acids as well as a means to boost one’s protein intake. If fish comes from regional and local sources, the carbon footprint of fish eaters tends to be smaller. Lucas expressed his dislike of industrial farming and doesn’t support businesses that are cruel to animals. Yet, how does he conscience eating fish in light of concerns that the Earth’s oceans are becoming overfished? Lucas believes the meat industry to be more inhumane to animals, and even to its workers, but he agrees there is a problem with the fish industry as well. “I only eat wild or sustainably sourced fish, such as salmon.” The key, he says, is to ask where the fish comes from when buying it at the market or ordering at a restaurant. It has been 10 years since Lucas took his last bite of meat—he no longer has a racing heart rate, and now runs with ease. Even with an active lifestyle, Lucas has no trouble consuming enough calories. He eats a variety of plants, including seaweed and leafy greens, and regularly devours rice and beans. “And I drink a lot of these,” Lucas says with a smile, as he slurps down his last sip of his plant-based protein shake before heading to work with his next client.